5 Bedroom Detached House For Sale in Watford, Hertfordshire for Asking Price £1,550,000. The Volte, A fabulous spacious family home offering 5-Bedrooms and 4-Bathrooms and 3 receptions including a Lounge, Study and Media Room. Heronslea’s flagship development of luxury family houses are surrounded by greenbelt countryside and woodland. The Ridings offers modern living in a delightful historical, rural setting. 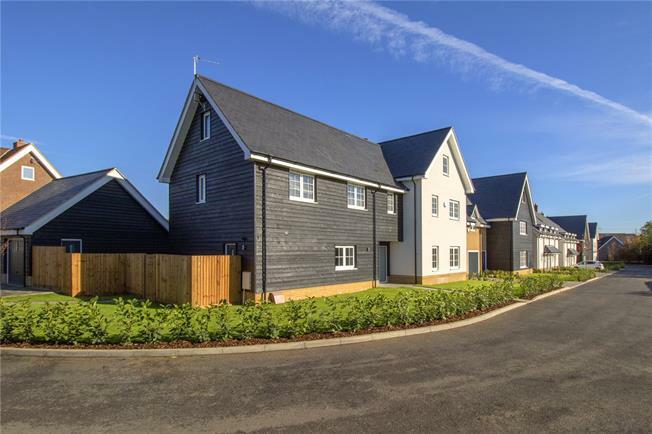 Each of these desirable properties has been carefully designed to the highest specification with sleek modern kitchens, luxurious bathrooms offering the ultimate in contemporary living. Within the catchment, there are a large number of local primary schools and secondary schools as well as private schools including Haberdashers’ Aske’s and the long established Aldenham School, Edge Grove. - Kitchen with Porcelain worktops and matching upstands. Miele appliances to include single oven, combi oven, induction hob, Siemens integrated fridge/freezer, dishwasher, extractor hood, washing machine, tumble dryer. Stainless steel sink/waste disposal and Blanco pull out spray tap, Quooker Hot tap. - Contemporary fully tiled Bathroom and Ensuites with luxury fixtures and fittings. - Fully fitted wardrobes to Bedrooms. Dressing Rooms to Master Bedroom and Bedroom 2. - Gas fired underfloor heating throughout. - Flooring to include: Tiling to Hallway, Kitchen, Utility Room, Guest Cloakroom and Bathroom/Ensuites. Wood flooring to Study. Carpet to Bedrooms. - LED downlighters to all rooms. - CAT6 and coax cabling, Data network cabling and fully TV/Sky+ multi-room wiring. - NACOSS approved alarm system. - Landscaped communal grounds and gardens. - 10 year Premier Guarantee. Marketing Suite open Thurs-Mon from 10am-5pm. For further inforamtion, please contact Preston Bennett New Homes on 020 8954 8626. There are a large number of local primary schools within a ten-minute drive as is the prestigious Haberdashers’ Aske’s voted Independent School of the Year 2017 in the Sunday Times and Aldenham School both providing a first-class education. Aldenham Country Park is close by offering 100 acres for country enjoyment. The Ridings is a short distance to A1 ,M1 and M25 and internationally Heathrow and Luton Airport are within easy reach. Rail links to Watford train and tube are also close by. treehouse slide and zip-wiring. The 60 acre lake inside the park is home to Aldenham Sailing Club and a perfect place to while away many hours fishing and watching the many types of birds that have made the area their natural habitat.